Hispanics households have only a fraction of the wealth of U.S. households, on average. Hispanics make up 16.3% of the U.S. population, but own only 2.2% of its wealth. Hispanic households amassed $109,000 in wealth, on average, compared to $495,000 for all households in 2010, according to a recent report by St. Louis Federal Reserve researchers. Like black families, Hispanics have always lagged the general population in wealth building. This is in part because they had lower incomes, giving them less opportunity to save, said William Emmons, senior economic advisor for the St. Louis Fed's Center for Household Financial Stability. Also, Hispanics are often subject to higher fees and predatory lending at financial institutions, eating into their returns. During the housing boom of the past decade, however, Hispanics snapped up real estate. 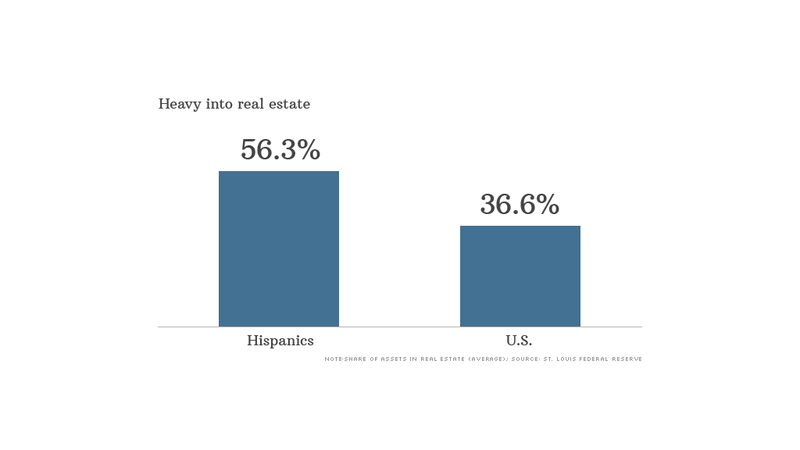 By 2007, half of all Hispanics owned homes, up from 46% five years earlier. 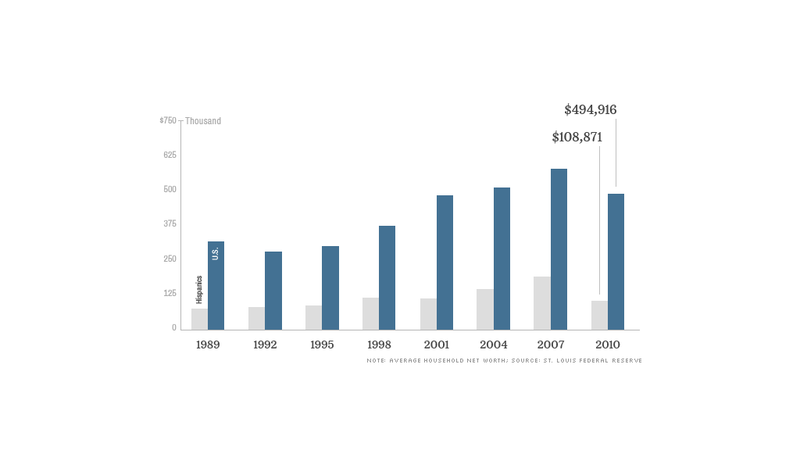 This expanded their average household net worth to $195,000 ... at least temporarily. Then the Great Recession hit. While most Americans saw their wealth shrink during the economic downturn, Hispanics suffered larger losses than other groups because housing made up a greater share of their assets. "Minorities are more dependent on housing wealth," said Rakesh Kochhar, associate director for research at the Pew Research Center's Hispanic Trends Project. They felt a "disproportionate effect of the housing crash." 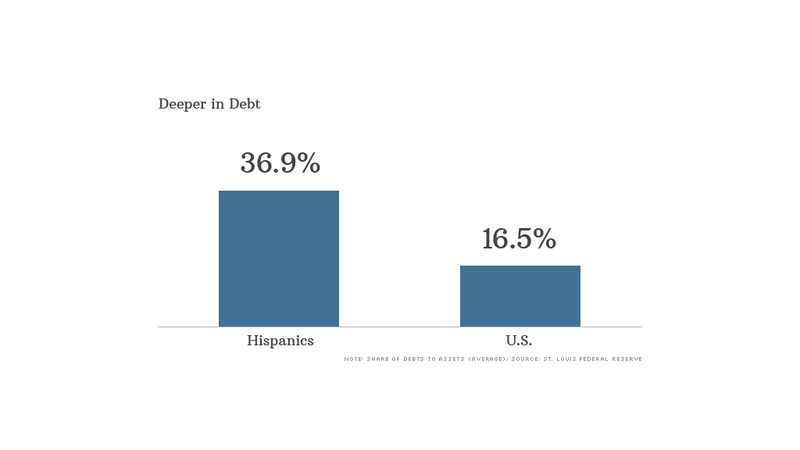 Hispanics also carry more debt than the average American family, putting them on shakier financial footing. Much of this stems from higher levels of mortgage debt. It remains to be seen how Hispanics have done since 2010, which is the most recent data available. 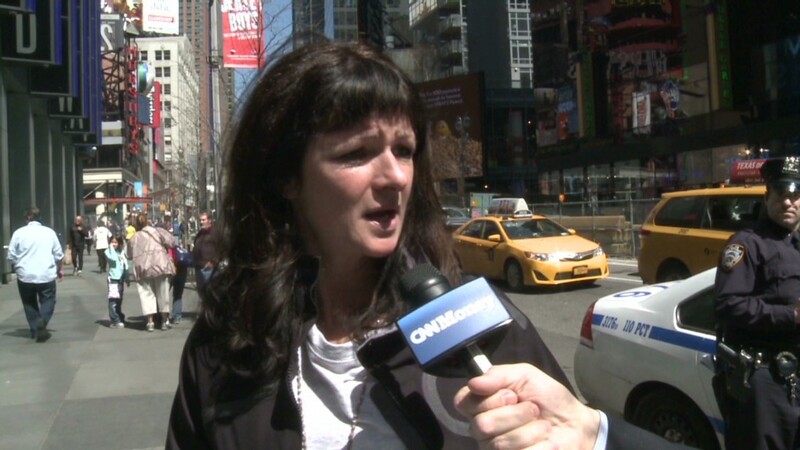 But they likely haven't had much of a rebound, compared to the U.S. as a whole, Kochhar said. That's because much of the recovery so far has been in the financial sector, not the housing market. Going forward, Hispanics total wealth is likely to grow faster, but mainly because they will make up a bigger chunk of the population in coming years, Emmons said. How well the average household does, however, depends on whether Hispanics are able to recover from the losses suffered in the Great Recession. If they are, average household wealth could grow to $255,500 by 2025. Otherwise, it will only creep up to $140,000, Emmons projects. What's the trick to getting rich? Kochhar sees reasons to be hopeful that Hispanics can accumulate more wealth in the future. That's because the Hispanic labor force is shifting away from undocumented immigrants to more native-born Americans. And foreign-born Hispanics are growing more assimilated, so they will send less money back to their home countries. Also, education levels and college attendance are on the rise. This points to higher income growth, Kochhar said.